I awoke this morning at 5:15 in order to chant 108 repetitions of the “Asato Ma” prayer (“lead me from unreal to real; from darkness to light; from things that dies of, to that which is everlasting”) as the Full Moon peaked. Yup, it’s that time again – time to utilize the tools of change in a very deliberate effort. 2012 was a fantastic year of becoming stronger on the inside and gentler on the outside. For me, this shift is a welcome result of ongoing inner work. Still, these days, my dreams, sensations and experiences are messaging me that something big is beginning to boil. I hope to harness that “something” while it’s still simmering, so I can be in harmony with it, rather than subject to it. I don’t know what this “something” is. I have an inkling the shift is related to my Purpose (upper case “P”), and my related work. I do know this: the night of the Winter Solstice, my heart exploded (see my last blog for details); days after, I had a dream that I dropped my future self on her head and she suffered horribly; and over the past week or so, I’ve been tripped up by surprising triggers. So although the one-year period of late Fall 2011 through just weeks ago has yielded so much positive, this recent shakiness is not to be ignored. I truly believe it could yield some major change for the better – as long as I stay aware of and present with the shift. So this morning, yes, I set the shift in motion by awakening before dawn, lighting a stick of my new incense (a holiday gift, appropriately branded “New Energy”), practicing Pranayama and chanting. And I plan to do this every morning for a month, until the next Full Moon. As with all of my other intention “projects,” I am not trying to force a specific outcome – simply to bring New Energy to my life, to witness these shifts and to see what evolves. During this morning’s meditation, a few things came clear. I need to make immediate amends for potentially harmful words of late. I just need to check in with some dear ones about some tongue-in-cheek remarks. Because I aim to be non-violent, I value accountability and I desire honest, healthy and caring relationships. 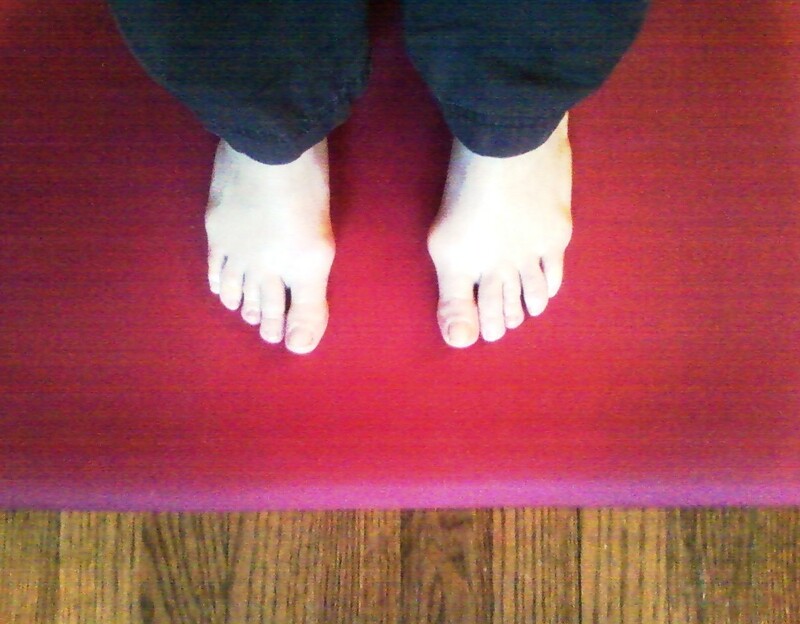 Another moment of clarity – I have fallen off the yoga wagon and need to get back on with urgency. Because yesterday’s stream of dark consciousness on Facebook exhibits that I am off-balance. ‘Nuff said. Among other realizations, 2012 has been an enlightening year to observe that, as I’ve aged, a very specific, monthly, 10-day time period has evolved – during which I feel as though I do and say everything wrong – and/or I feel wronged by everything others do or say. Hmmm… Despite being well-aware that this time period – and its chemical propensity toward miscommunication and misunderstanding – is approaching, and despite progressively increasing precautions, such as changing my diet, taking nutritional supplements, and, promising myself to stay the heck off of Facebook and away from potentially rattling situations…without fail, the unreasonable and strangely obligatory impulse to dive in, wound and be wounded wins. Mama mia. So yes, it’s time to seek a hormone specialist. Because 10 days is just too much life to lose to emotional insanity! I’m giggling at myself while scribbling this in my journal. Ay, ay, ay – another life lesson. Looking forward to witnessing more and more over the next 30 days…and beyond, of course! Indeed. I am. Full of shift. Last night I shut the door on The Past. I had a sudden, sharp feeling that it was time. So I shut that door and I shut it hard. The Past might have gotten a shoelace caught while trying to jam its stubborn little foot in the way. And one day in the future, that shoelace might thread its way into some pushy PTSD trigger or round of unresolved grief. But for now, the door to The Past is shut and I’m standing on THIS side of it. Yes, I am standing in The Present. I’m not a New Year’s Resolution kind of gal. I’m an every-day intention setter. Still, this is a powerful time of year, as the collective conscience of most humans is evaluating the past, assessing the present and changing for the future through the process of making Resolutions. Because the universe seems to be elbowing me into that process, I’m going with it. My 2012 New Year’s Resolution is (drum roll please)…to heal, GROW and serve. Same as my every day intention. For the sake of this blog (and my personal transformation), I’m capitalizing GROW. Because I did a lot of intense healing work in 2011. And in order to transmute that work into being of service in the world, I need to GROW out of and up from The Past, from which I’ve had to heal. Which wisdom will win in my case? I know from experience that the stakes of personal development are often pain. Motivator/writer Kris Carr says, “Do the big maddening ouch work. The cosmic honey lives inside the pain.” I couldn’t agree more. In 2011, I examined The Past so I could get to the bottom of some negative patterns and start to cultivate positive alternatives. Although the process has been painful, I have come to forgive, accept and honor my past. After all of that examination, I don’t regret it. In fact, I am grateful for all of its mistakes and lessons. However, because I have been so devoted to understanding The Past, it can sometimes crowd out The Present. Despite all the discomfort I feel while exploring it, The Past can begin to feel quite comfortable. My dwelling on and in The Past can get so thick that it becomes a mask, and I hide behind it. So as the Man in Black suggests, I am closing the door on it. Pour out the drink. Put down the gun. Unclench your fists. Stop your running. Turn off the TV. Say so long to the sugar. Flush the pills. Abandon the computer. You will be loved. You will be safe. You will be true. You will be whole. Love will feel strange. Safety risky. Truth bewildering. Wholeness scary. Life will feel messy. Because you will be feeling. It will be worth it. (We promise.) Because we are all healing. I get a little stuck in my story sometimes. The sad, sad story of The Past and the sad, sad places it has taken my family and me. The story includes many traumatic events. It includes destructive patterns that led to horrible decisions that led to dangerous, harmful and/or painful consequences. My story is sad. But I am not. Because I am not my story. I consider myself a happy person. I’ve said it before, I know. And it’s true. Small things bring me great joy. Even in the midst of a big, fat grump-fest, if I hear a child laugh, or see a leaf float down from a tree, or learn of someone else’s good fortune, I immediately feel happy. It’s in my cells, the fiber of my being, to be happy. I feel most comfortable with inner peace and shining light. As you may have read, I recently went to battle with “an annoyingly encroaching emotional darkness” during my 100-day ritual, “The Happy Heart Project.” During that period, I had to face some hard truths about my past, my now and my future. I re-learned the value of examining and assessing and transforming. Yup, just like our New Year’s Resolution process. And just like my daily intention to heal, GROW, serve. At the same time, I learned something new. The Past serves an important role in informing The Present; but it can be downright traumatic in itself to get stuck there. Hence the growing pangs. Time to get unstuck. I am not my story. I am not The Past. Getting back to last night. I was crying out of frustration. An old, familiar dissatisfaction. The habitual complaint of, “When will anything change?” Boo-hoo-hoo…and then, PANG! It hit me like a ton of bricks. I HAVE CHANGED. Life has changed. Everything has changed! I stopped crying. I stepped through the door and shut it behind me. With a powerful, physical sensation, I felt myself standing in my now-ness. Finally recognizing its amazing people, enriching practices, time-tested talents, joyful activities, defining values. The now is new. The now is wow! As I planted my feet in The Present, I saw that all is waiting. All is waiting! I have been dreaming about my teachers. Family members, yoga instructors, favorite bloggers, authors and others. A few weeks ago, I dreamed that one of my yoga instructors was reminding me to be teachable. In another recent dream, my whole family (of origin) was moving to New Orleans. We were driving in an old station wagon. I’d had my head phones on for most of the ride, listening to music. When I noticed it was raining pretty hard, I turned off the music and asked, “You doing OK up there, Dad?” My sister corrected me, “It’s Mom driving.” And just last night (after the big shift), I dreamed I was with a yoga instructor whose writing and ideology inspires me. We were climbing. He was new to this path and I was leading the way. I felt eager, awake, on-fire. Excited to get to the top and share the view that had rocked my world so many times before. Clearly, it’s time to move onward and upward, and to see what’s in the distance – instead of constantly looking back over my shoulder.